• Available with maxijacket coated for extra wear protection, please call for pricing. Our winch lines are made from a polyester double braid rope called Double Esterlon. Double Esterlon has low stretch, high strength, excellent wear life, dielectric strength. 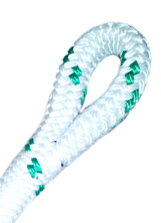 It is identified by two green strands braided into the cover structure, and is available with optional Maxijacket urethane coating to further enhance the ropes wear resistance. Our certified rope splicers will splice an small eye on each end of the winch line and also tag the winch line with its breaking strength and manufacture date. Custom lengths are available, please call for pricing. Your Price: Please select length.